These flags are extremely sensitive. They pivot on a ball bearing system. Both the flags and the propellers are made of a lightweight polymer. 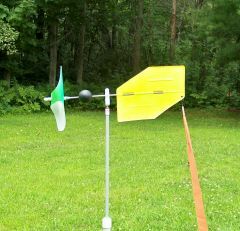 The flags and propellers are both two-toned to help determine wind speed and angle. Each flag also has a streamer tail. 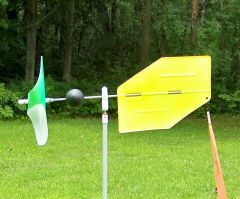 An adjustable, lightweight mast pole and anchor pin are included with each flag. 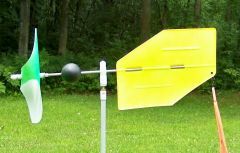 Both the pole and the anchor pin are made of a durable fiberglass and polymer. The poles are adjustable from approximately 24" to 42". Sold as a set of 4 flags with poles. Be sure to include your email address in the email!